Say “Happily Ever After” with a Mr. & Mrs. Theme! You’ve waited so long for this special day! And you may be a modern bride, but becoming his Mrs. sounds pretty good, doesn’t it? Then why not indulge with a few mementos marked with Mr. and Mrs. to celebrate this momentous occasion? Whether your Mr. and Mrs. themed products are incorporated into your wedding theme, starting with the invitations; are a gift to each other; or are put on display in your home, you’ll love our brand-new ideas that highlight your new union as husband and wife. Here are our top 5 Mr & Mrs wedding theme ideas! Choosing the Mr. & Mrs. Day Invitation is a wonderful way to celebrate your upcoming nuptials. It’s such a classic and simple invitation with the words in elegant silver foil with an embossed ampersand and border. What more is there to say? 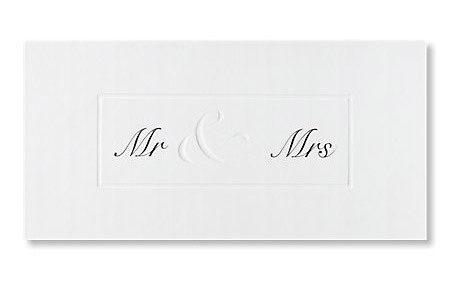 Oh, except for all those delicious details inside the Mr. & Mrs. Day Invitation. Wedding rings don’t have to be the only type of rings given to each other as a symbol of your love. These Mr. & Mrs. Keyrings are simple enough for your groom’s keys, yet dazzling enough for your own. They make the perfect gift for each other and will remind each of you of your perfect wedding day. The keyrings come in a gorgeous presentation box, too, making them an even more special wedding gift item. 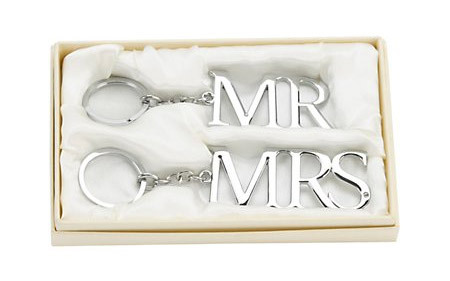 A perfect addition to your wedding’s theme, go online to order your Mr. & Mrs. Keyrings. 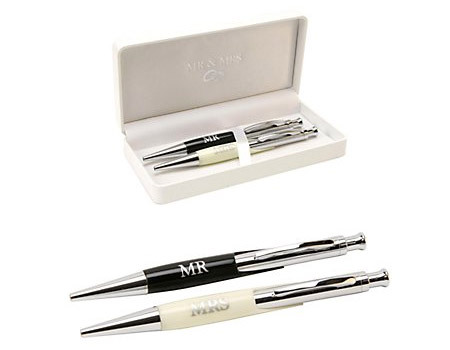 Test out your new Mr & Mrs Pen Set while you sign your names on the dotted line — on the marriage licence that is! It’s one of those sweet details that you will appreciate when you use it that day and forever after. Keep the pen set as a keepsake of the experience, and get a rush every time you sign your new last name with the Mr. & Mrs. Pen Set! We know it’s difficult to only choose four! 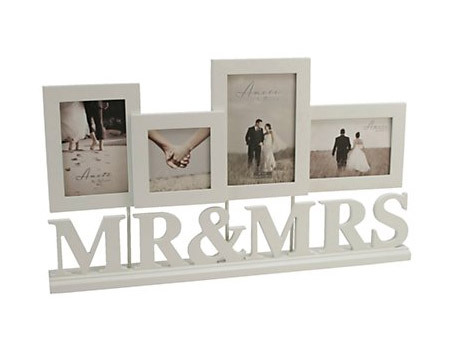 This stylish photo frame, with its simplistic ivory and inset Mr. & Mrs., showcases your amazing wedding day photos well. The neutral tone lets you and your groom be the stars instead of overshadowing. Now place it somewhere special in your home where guests can admire your cuteness. Take a closer look at the cherished Mr. & Mrs. Wedding Photo Frame. If you’re in need of lovely keepsakes for your wedding, we offer an exquisite collection dedicated to items guaranteed to bring sentimental value. 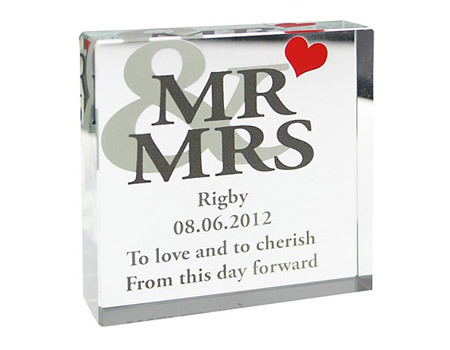 Start your search for the perfect Mr & Mrs Keepsakes. Celebrate Becoming Mr & Mrs While Saving A Fortune! Don’t miss out on this month’s sale with huge discounts available across selected items! You’re bound to find the perfect pieces to help you nail your Mr & Mrs wedding theme. Make sure you check out more of our sale items. Did you buy any Mr. & Mrs. product for your wedding? Tell us about it! Share your great ideas with fellow brides by posting yours it on our Facebook!